This is from a concept design class I'm taking at the school I'm teaching at. Instructor Christian Gossett( Red Star creator) had everybody 'redesign' Skynet from the latest Terminator. So here it its: a walking, destroying machine factory whose mother might have been the Queen Alien! I used many elements from the films, as well as Transformers, to piece this thing together. About four hours work, thanks for lookin'! at first i though "that looks like a giant xenomorph." and then i thought "oh wait.."
It looks more like something you'd see in the matrix rather than terminator. Mainly because of the robotic tentacles above and the red thing in the center that looks like the chambers they keep the humans in. It's still a very good piece of work. Sort of looks like the Alien Queen from the ALien films, only with mechanical parts. Not saying it's a bad piece of work though. Would love to see something like this as a boss battle in a game of some sort, that would be fun. looks like the alien queen. Yur so ded lol. Anyway, good job. This is Amazing. Thank you for make this composition and for share it in dA. You take care of all the details. Call Cameron and tell him to make this happen. OH MY GOD!!! O_O it's a nightmare!!! If there were any justice in the world, you'd be the only one to get an A in that class. This reminds me of the final battle in Animatrix - the Second Renaissance. What a great job you did on this. John Henry, is that you? looks really something out of class. Nice, ya know that sky net core already has a giant leggy tentacley guardian right. the T1000000 basically a small building sized liquid metal spider, that hides in the core room as a railing around the core. Kinda looks like a Reaper from mass effect. Still, an awesome piece of artwork. This is really amazing. This picture captures my imagination and it sends chills down my bones looking at it. That's a compliment by the way lol!!! Awesome work!!! So Arnold is in the cockpit then? I love this it's so awesome!!!!!!!! I bet they'll use your design for the movie that's how awesome you made the Skynet computer. Anyway. That's pretty darn cool. 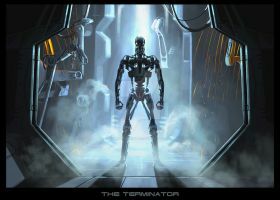 Too bad that Skynet is likely no more than a bunch of databanks in an air conditioned room. Whoa, its like optimus prime and a matrix squid had a baby!